Let’s see; Brown (ish)? Check. Manuel? Check. Wagon? Check. Diesel? Well, there is no model designation, so you can’t say its not. Check. Yep, on this 1/18 day, I’m bringing a brown, manual, diesel wagon. My years of experience as an internet auto enthusiast tells me that I just shut this shiznit down. Y’all can go home now. 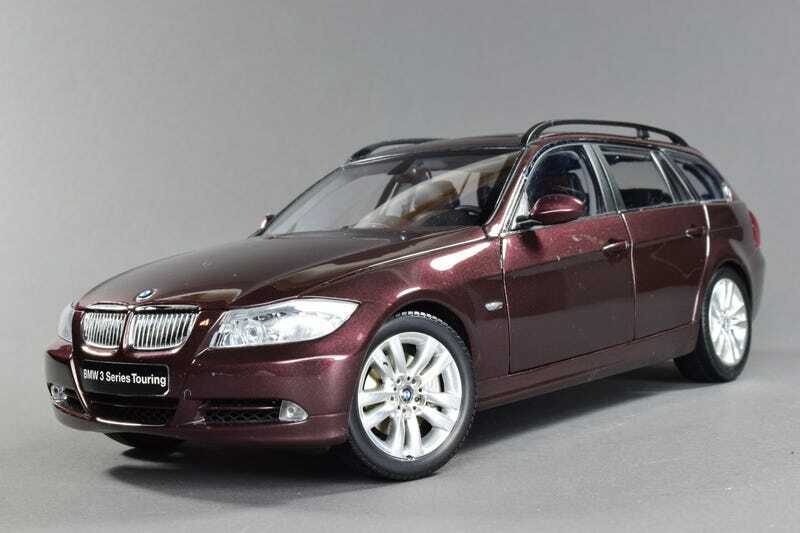 For those of you still here, this is the E91 version of the 3-series Touring, and was produced during the time Kyosho had the BMW dealer model contract. I’ve reviewed these Kyosho BMWs before, and there is not much to add here other than to say it has just about all you can ask for in a model. It’s diecast, it has carpet, and all 4 doors open. As Sn210 will attest to, cocaine unboxed models can be a hell of a drug deal. And this unboxed beauty was all of $49. When new, these were in the $60-80-ish range, but most listed on ebay now are around $150. However, looking at sold listings show at least 4 other cars that sold for $100 or less, so you can score a deal if you’re patient Philipilihp.